The folks at TEC Accessories got in touch with me recently and offered to send me a sample of their popular PicoPen free of charge for review. There have been several readers during the time I have been running this blog mention the PicoPen to me, so I took them up on their very generous offer and got the PicoPen in my hands to try out. Upon opening the envelope, I was very impressed with the packaging that the pen arrived in. The tin case is similar in shape and size to an Altoids tin, and opening it up reveals the PicoPen and the various accessories that come with it (see slide show at bottom of post). Since this pen is designed for portability, the amount of attachment options is a pleasant surprise. From the 10mm split ring, to the wire rope, to the snap ring, you should be able to hang this pen anywhere for quick access. And I do mean quick access. The cap is attached to the pen by a magnet, which holds the pen in place quite nicely, but allows you to pop it out and write with ease. The PicoPen body is only 3/16" in diameter, so writing with it was a bit of a challenge. I found myself fidgeting with the pen at first to find the proper position, but once I locked into that position I was able to write just fine. This isn't a pen made for long stretches of journaling, but in short bursts it does an admirable job. 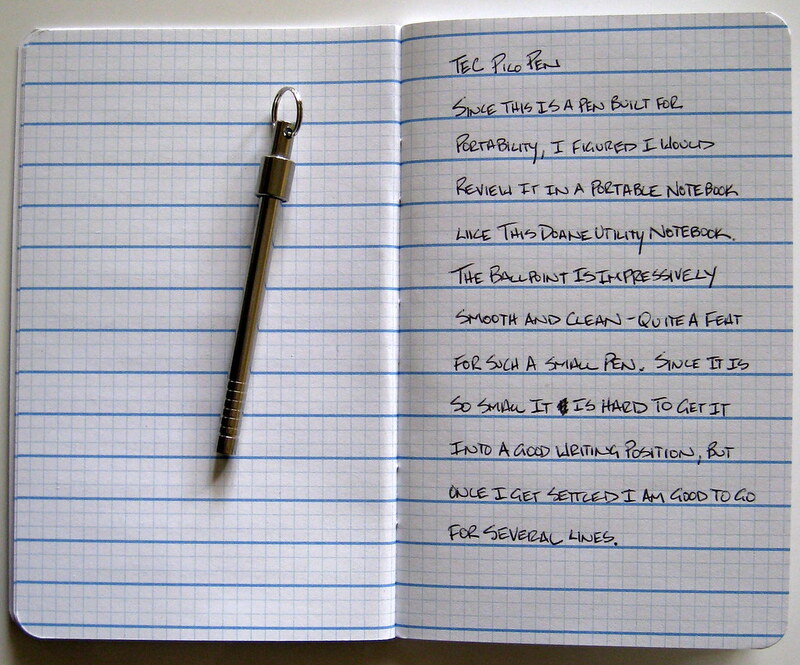 The ballpoint was very easy to write with, and both the tip and the page stayed very clean, which I was happy with. Overall, the PicoPen provides an impressive package of portability and functionality. I attached mine right to my keychain after reviewing it, and you barely notice it is even there. As much of a pen addict as I am, I still find myself without a pen handy from time to time. Now, if I walk out the door with my keys in hand, the PicoPen has me covered. Thank you to TEC Accessories for providing this pen for review. The full specs are listed below, as well as a slide show of some of the pen accessories. Posted on August 3, 2009 by Brad Dowdy.